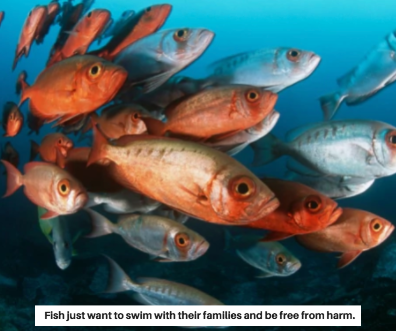 When we talk about creating a compassionate world for all animals, often left out of the conversation are the more than 30,000 known species of fish. This is more than all other species of vertebrate animals combined. Kosher laws classify fish as parve. Rather than being seen as meat, fish are placed in the same category as plants. In light of what we now know about biology, this no longer makes sense. Just like us, fish feel pain. Fish have pain receptors and nervous systems very similar to mammals. They exhibit clear signs of suffering, such as trying to get out of and avoid harmful situations. You can observe this quite clearly when fish are caught. As they suffocate, they squirm violently. We might not hear them scream when they are impaled with hooks or caught in nets, but their behavior and extensive research indicate that they are in excruciating pain. Fish have complex social relationships, can recognize one another, and are highly intelligent. Migrating fish, like salmons, can travel long distances for years on end and find their way home from thousands of miles away. Culum Brown, an associate professor of biology at Macquarie University in Australia writes in his paper, “Fish Intelligence, Sentience and Ethics,” that fish can even figure out who in their social circle is untrustworthy. He gives a specific example of a pair of fish who are advancing toward their prey. If one fish does something to cheat in some way, the other fish will not only refuse to cooperate with the cheater in the moment, but will also hold this against that fish during future encounters. Dr. Jonathan Balcombe, Director of Animal Sentience with the Humane Society Institute for Science and Policy, has written over 50 papers on animal behavior and protection. He has found that some fish use tools like water as a projectile or coral as an anvil to smash open clams. Fish such as frillfin gobies use mental mapping to leap accurately between tide pools. Other species such as archerfishes learn by watching experienced colleagues squirt water at flying insects. Fish look different from us and are therefore are often misrepresented and misperceived. This is highly problematic because more fish are killed each year for food than any other animals. Globally, an estimated 1-3 trillion wild-caught fishes and 37-120 billion farmed fishes are killed commercially for food each year. 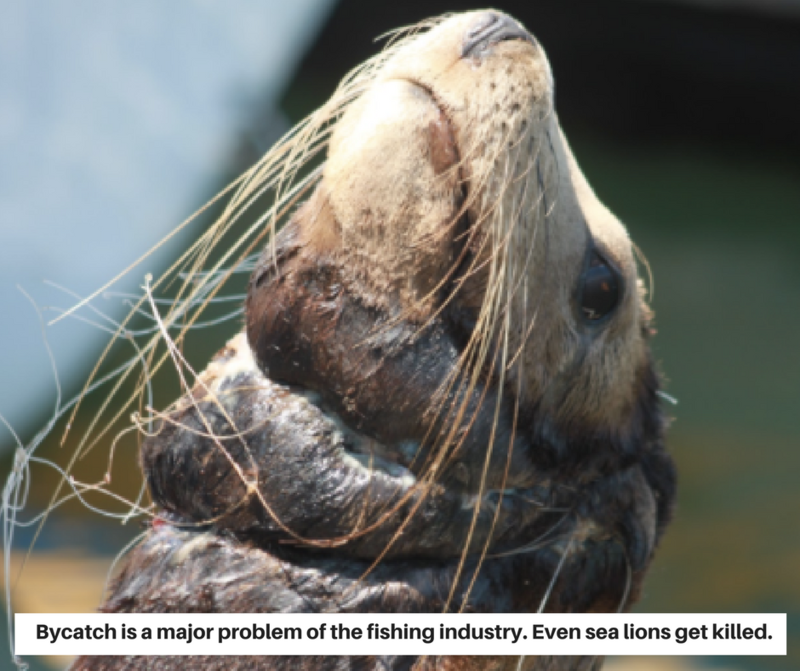 These estimates are so wide because the fishing industry measures their catches in weight rather than by the number of animals who are caught. Hundreds of millions more are killed for “sport” each year in the U.S. alone. Fishes are also increasingly replacing other animals for scientific experimentation. Approximately one-quarter of all the animals used for research and education in North America are fish. Additionally, some 1.5 billion are used for aquariums. Commercial fishing uses massive ships with a few different types of methods of catching fish, each one with a different set of problems. One of the most common methods of commercial fishing is called long-lining. Ships unreel into the ocean about 75 miles of line with hundreds of baited hooks. The hooks lure in the fish, who either drown or bleed to death and are often left struggling for hours. Long-lines injure billions of other animals as well including sharks, birds, and turtles. If fish are still alive when they are pulled on board, they either suffocate or freeze on ice to death. Gill nets are also commonly used in commercial fishing. They range from 200 feet to over a mile in length, with floats at the top keeping them upright. Fish cannot see the netting and therefore get trapped inside. As they try to desperately escape, the netting wraps around their gills or fins and often suffocates them to death. If the fishes remain alive, they might struggle for days and eventually get cut open alive once aboard the ship. Little known is that 40% of the catch during commercial fishing operations are of animals who were not actually being targeted. 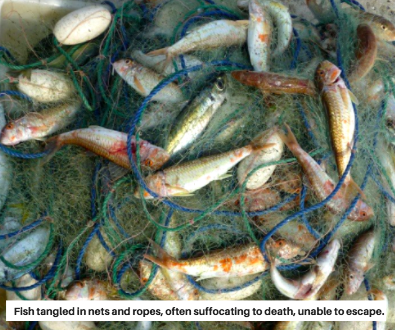 This is known as bycatch and often includes whales, dolphins, sharks, and turtles. The World Wildlife Fund estimates that over 300,000 small whales, dolphins and porpoises die annually from bycatch. Globally, fish farms cause intense suffering and environmental degradation. Fish are confined to small pens, often squeezed in with so many other animals that they are starved for oxygen in the water, and gasp for air above the water level. Diseases like sea lice, which pick away at fishes’ skin, spread extremely quickly, causing the animals extreme discomfort. Aquafarms, as these places are sometimes called, are the most rapidly increasing source of seafood. The can be housed on land (as in the picture below) or in the oceans, with fish trapped in large nets for their entire lives. With so many animals pooping in one place, there is a massive amount of waste built up, and it affects wild animals, too, by polluting the water and causing eutrophication, a process that removes oxygen from the water, thereby killing even more fish and other ocean wildlife. Additionally, consuming fish also harms human health. Wild and farmed fish live in increasingly polluted waters, and therefore their flesh absorbs and accumulates high levels of toxins. The mercury discovered in fish, for instance, has been found to cause brain damage. Seafood is also the number one cause of food poisoning in the United States. Even “catch and release” sport fishing comes with a whole host of issues. Once fish are released after being caught, they are much more vulnerable to disease. Many of them lose their protective scale coating, exposing them to a much higher risk of illness. Often times their fins are damaged, which causes fish to have a hard time escaping predators. Whether you are thinking about fishing as sport or fish for a meal, the harm is profound to fish, to our oceans, and to our own health. Genesis 9:3 – Permission to Eat Meat?